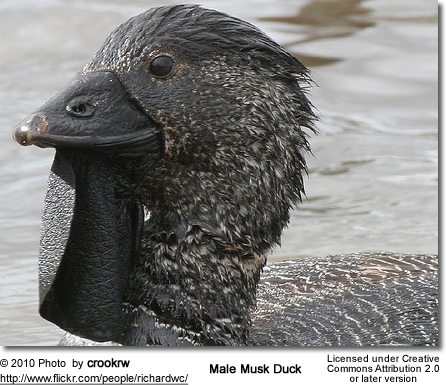 The Musk Duck (Biziura lobata) is a highly aquatic, stiff-tailed duck native to southern Australia. They are moderately common through the Murray-Darling and Cooper Creek basins, and in the wetter, fertile areas in the south of the continent: the south-west corner of Western Australia, Victoria, and Tasmania. Musk Ducks avoid the far north, or the arid west and north-west. It is the only living member of the genus Biziura. An extinct relative, the New Zealand Musk Duck or de Lautour's Duck (B. delautouri) once occurred on New Zealand, but is only known from prehistoric subfossil bones. It was about 8% longer than the living species, with a particularly large head. Adult males are 60 to 70 cm long and have a distinctive large, leathery lobe underneath the bill; females are 47 to 55 cm long and unadorned. Their drab dark grey-brown, sightly pin-striped plumage is unconspicuous and does not differ between the sexes. Musk Ducks float very low in the water, almost like a cormorant, and the large webbed feet are well back on the body. The ducklings are covered in dark brown down. In its native range, the fanned tail is distinctive, allowing to distinguish this species from the Freckled Duck (Stictonetta naevosa) which has similar size, coloration and habits. The Blue-billed Duck (Oxyura australis) has a similarly shaped tail but the main colour of its males in breeding plumage is a much richer chestnut brown. 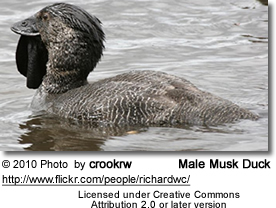 Females and males in nonbreeding plumage are very similar however and if one is not intimately familiar with the slight differences in behavior, they cannot be told apart from female Musk Ducks at a distance. 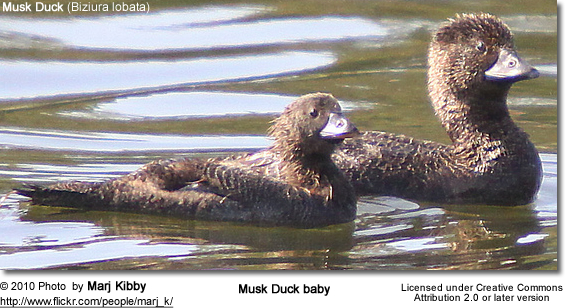 Male Musk Ducks in the breeding season are usually unmistakable due to the large bill lobe. The relationships of this peculiar species are quite enigmatic. It is traditionally included with the stifftail subfamily Oxyurinae, but appears only distantly related to the genus Oxyura, and its peculiar apomorphies make it difficult to place. Its relationship with the equally strange pink-eared ducks (Malacorhynchus) is unresolved but seems to be quite close, and it seems to be part of an ancient Gondwanan radiation of Anatidae. As such, it is quite closely related to the stiff-tailed ducks proper, but as it seems not as closely as generally believed, with many similarities due to convergent evolution. This species prefers deep, still lakes and wetlands with areas of both open water and reed beds. They seldom emerge from the water and are awkward on dry land. They rarely fly: take off is made with difficulty, and landing is a clumsy, low-angled affair with no attempt to lower the feet. However, at need Musk Ducks fly swiftly and for long distances, with rapid, shallow wing beats. In the water, Musk Ducks display an effortless agility, twisting and turning on the surface with both feet and tail. In general, Musk Ducks remain in the water all day long, alternately loafing and feeding energetically, though they sometimes emerge to sit on a log or on dry land for a while. They stay on the water at night, sleeping well out from land with the head tucked into the body or under a wing. Musk Ducks are very much at home below the surface, slipping under head-first with barely a ripple, and staying submerged for as long as a minute at a time, often resurfacing only for a few moments before diving again. They dive to escape predators or unwanted company, and to search for food, typically in fairly deep water. They can descend to at least 6 metres (about 20 feet). The primary diet items are water beetles, yabbies, water snails, freshwater shellfish, and the like, supplemented with a variety of aquatic plants and a few fish. When not breeding, adults are generally solitary. Adult males hold and defend territories, excluding other males and quite often females too. Younger birds – juveniles and unmated adults – form flocks on larger bodies of water at some times of year. It is not known at what age they reach sexual maturity in the wild, but it may take several years. They are a long-lived species and are still capable of breeding when 20 years old or more. The Musk Duck breeding season varies with rainfall and water levels, but is typically between July and January, with the greatest number of clutches laid in September or October. 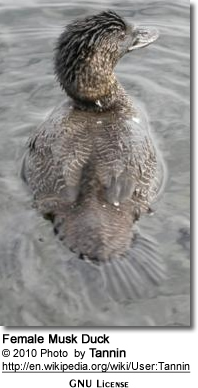 Despite a number of more general studies, remarkably little is known about Musk Duck breeding: in the season males advertise themselves loudly with a repetitive sequence of sounds: first, a ker-plonk splash made with the feet on the surface of the water; then two soft, sharp cuc cuc calls; then a loud whistle and a deep grunt. This sequence can be started at any time of day or night, with or without an associated visual display, and repeated every 4 or 5 seconds for as long as half an hour at a time. 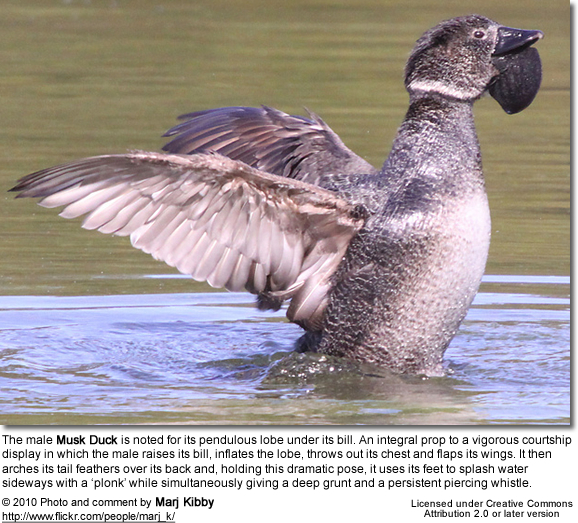 Although male Musk Ducks have a large leathery lobe below the bill and this swells during the breeding season, it is not connected to the vocal cavities and appears to be purely for visual purposes. It is thought that mating is promiscuous, quite possibly on a lek system like that of the Kakapo (a very large, flightless parrot found only in New Zealand), but this remains uncertain. The male plays no part in building the nest or raising the young. Females select a secluded location for nesting, usually in tall reeds well away from land and protected by deep water, or under the cover of overhanging shrubbery, but sometimes in a range of innovative places, such as on a stump, in a hollow log, or even under an upturned boat. The nest is a simple platform of trampled plant material with a slight cup, lined with fine plant matter and, after the eggs are laid, plenty of down. She seems to be unable to carry nest material and must rely on whatever is within reach. With the nest complete, she pulls reeds down from overhead to make a canopy, hiding it from view. When leaving the nest to feed, she slips quietly into the water and submerges, not surfacing until she is well away from it. Clutch size in unknown: as many as 10 eggs have been counted in a nest, but it seems likely that this is the result of dump nesting: 3 or 4 eggs is considered more likely. In most cases only one chick survives, sometimes two. They are able to swim and dive within a few days, after which they probably leave the nest. Young stay close to the mother for several months at least, sometimes riding on her back to begin with. They can peck at food items on the surface and dive a little while still quite small, but the mother continues to provide the bulk of their food until they are almost full-grown. Musk Ducks are sometimes shot by hunters but are little prized, not being considered good eating. Wholesale clearing and draining of wetlands has impacted on their numbers, as has the widespread rise in Australian water salinity levels, but the species is not presently considered to be in danger. Pink-eared Ducks are dependent on plankton, as well as crustaceans, mollusks and insects. Their bill is well designed for straining minute organisms, with pliable mandibular flaps that channel water in a manner that allow the ducks to filter algae and other plankton efficiently. They also feed by vortexing, in which two ducks spin about a central point with the head of one opposite the tail of the other, concentrating food in a gyrating water column. Ducks generally feed on larvae and pupae usually found under rocks, aquatic animals, plant material, seeds, small fish, snails and crabs. We all enjoy ducks and many of us offer them food to encourage them to come over and stay around - and it works! Who doesn't like an easy meal!